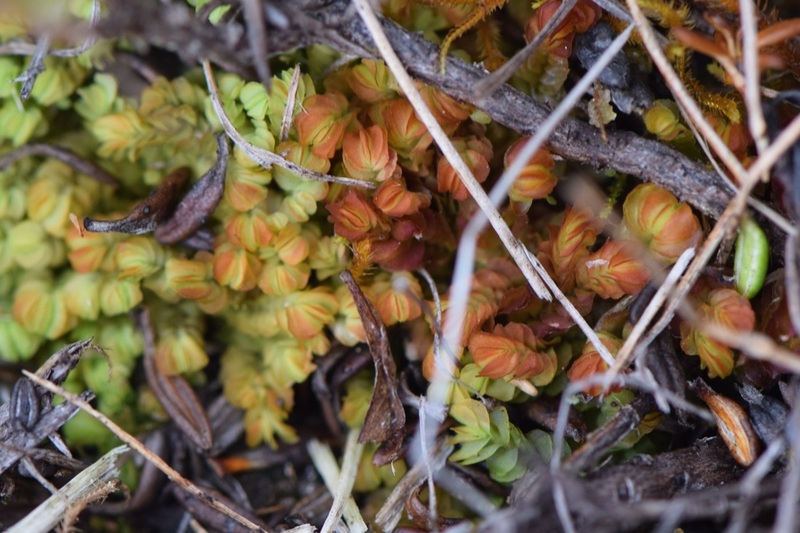 Hard scale liverwort in a bog on Calvert Island. Photo by Nancy Shackelford. Hard scale liverwort is a large liverwort, growing up to 12 cm long with leaves as large as 2.5 mm. The leaves grow opposite to each other along the stems in overlapping shingles. The leaves are round to oval, with edges bent backwards, and have a reddish-green tinge in large populations. Hard scale liverwort can be confused with anomalous flapwort (Mylia anomola) but can be distinguished by flapwort's distinctive, narrow, pointed leaves and by the larger size of the hard scale liverwort. Pojar, J. and MacKinnon, A. (1994). Plants of Coastal British Columbia. Vancouver, BC: Lone Pine Publishing. P. 440. Rothero, G. Mylia anomala Anomalous Flapwort. British Bryological Society. Accessed 12/08/2014. Rothero, G. Mylia taylorii Taylor's Flapwort. British Bryological Society. Accessed 12/08/2014. Nancy Shackelford and Brian Starzomski (2014).